Written by: Yasuo Ohtagaki, Joe Yamazaki Stan! The science fiction manga, Mobile Suit Gundam Thunderbolt, is set in the classic anime universe of Mobile Suit Gundam. It apparently takes place simultaneously with the events depicted in the original “Mobile Suit Gundam” anime. Created by mangaka Yasuo Ohtagaki, this manga focuses on two rival mobile suit (MS) pilots, Io Fleming of the Earth Federation and Chief Petty Officer Daryl Lorenz of Principality of Zeon, each bent on destroying the other. 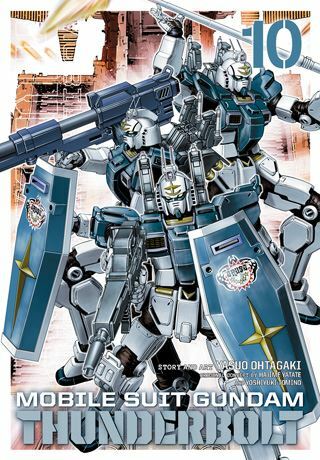 As Mobile Suit Gundam Thunderbolt, Vol. 10 (Chapters 80 to 88) opens, the Federation ship, Spartan, heads towards Pekanbaru Base to repair, resupply and rearm in the wake of the battle at the Nanyang Alliance's floating city called “the Rig” (literally like a giant oil rig). During that battle, Zeon's Daryl Lorenz was able to capture Claudia Peer, the former Federation officer who has knowledge of the whereabouts of the Alliance's Psycho Zaku facility. However, Lorenz will discover that he has much in common with his captive, something that may transform him. Meanwhile, Io Fleming is bitter and angry and ends up in the brig. But as others wish for peace, Fleming declares that he must have war to live. THE LOWDOWN: The Mobile Suit Gundam Thunderbolt manga is a fantastic read. I say that as someone who has had very little experience with the Mobile Suit Gundam franchise. Mobile Suit Gundam Thunderbolt Graphic Novel Volume 10 is one fantastic volume. The series is in the middle of a high period, which is saying a lot. The series is practically one long high period. This volume, however, feels like many characters are in a state of transformation. Io Fleming may be solidifying his ideology (or pretending to), but Daryl Lorenz seems to be moving beyond expectations. These characters are giving you reasons to want to stick with them. Well, I can't wait for the next volume, and you, dear reader, should start this series if you are not already enjoying its delights. I READS YOU RECOMMENDS: Readers looking for classic mecha manga will want the VIZ Signature title, Mobile Suit Gundam Thunderbolt.